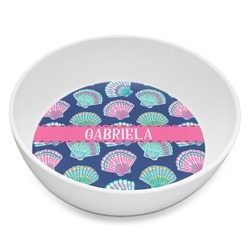 If you're trying to find the perfect dishes for a family full of all ages, these melamine bowls are the way to go! They are great for any age, but especially for the youngsters. 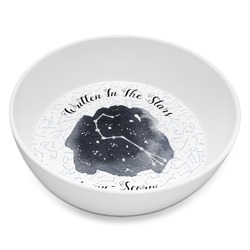 This melamine bowl holds approximately 8 oz (5.5" x 5.5" x 1.75"), which is the perfect size for an adult cereal bowl or a kiddo's dinner bowl. These bowls are break resistant, so they are perfect for a hectic household. Make sure not to put your bowl in the microwave, but you can definitely wash it in the dishwasher. Best part? They're BPA free! 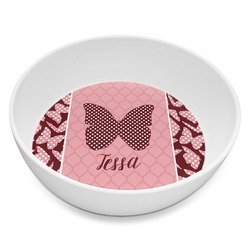 Now go into the design center to create the perfect personalized bowl. Have fun choosing fonts, colors, and patterns! Use a name or a fun saying to get a few smiles from whoever uses the bowl. Check out our other Melamine Bowls to compare. We also have melamine plates! Be sure to check these out, as well as the rest of our dinner plates in our dining room section.